Kid’s have headed or are heading back to school , which means summer is sadly winding down and fall is just around the corner. I think we all know what that means all of our favorite fall foods and not just pumpkin everything. I love pumpkin as much as the next person but some foods are being left behind in the pumpkin’s shadow like apples. I love apples and I am still mad at myself for never taking my kids apple picking when we lived in an area surrounded by apple orchards in New Jersey. I’m thinking this fall we may need to take a road trip to find an apple orchard where we can pick our own apples. We buy apples by the bag around here and i’m lucky if the last more than a couple days. I wonder how long a bushel of apples would last around here? I do know one thing I would have to hide some of the apples so I could make some yummy apple goodies like Apple Cinnamon White Cake. 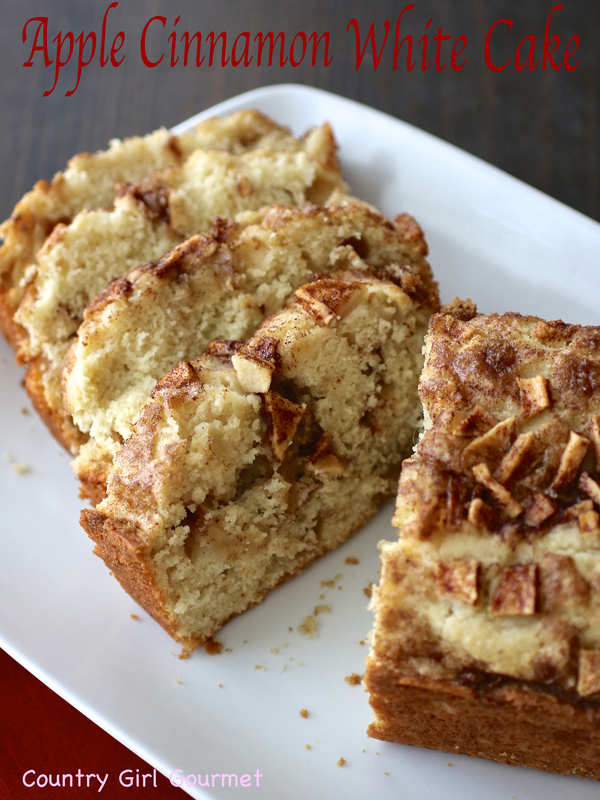 It is very likely you have seen a picture of Apple Cinnamon White Cake from Allrecipes on the internet. The picture was taken by a fellow Allrecipes Allstar and it went crazy in the social media world. I’ve seen it on Facebook and Pinterest multiple times and have been wanting to make it myself for a while. The kid’s had taken a break from the summertime devouring everything in the house and I saw a couple apples left in the crisper drawer so off to work I went. Since I wanted to eat this Apple Cinnamon Vanilla Cake I adapted the recipe to gluten free and let me tell you it was delicious! Preheat oven to 350 degrees F (175 degrees C). Grease and flour a 9×5-inch loaf pan. Combine gluten free flour blend, xanthan gum and baking powder together in a bowl; stir into creamed butter mixture. Mix milk into batter until smooth. Pour half the batter into the prepared loaf pan; add half the apples and half the brown sugar mixture. Lightly pat apple mixture into batter. Pour the remaining batter over apple layer; top with remaining apples and brown sugar mixture. Lightly pat apples into batter; swirl brown sugar mixture through apples using a finger or spoon. Bake in the preheated oven until a toothpick inserted in the center of the loaf comes out clean, 50 to 60 minutes.